Mornings without my toast sandwich at Durga's was unimaginable. 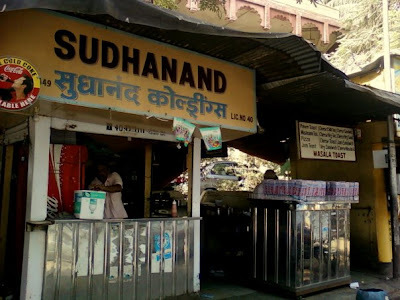 Like a daily ritual, lured by the taste of Babubhai's sandwiches, which has a tendency to linger on your tongue well after its consumed, I would end up daily at this roadside joint for my bite. Today is no different. Here I am, biting into my toast sandwich. Savouring the melting butter and crunchy bread in my mouth. I look around me. Everyone is in a tearing hurry. Motorbikes zig zag their way through the traffic while irritated drivers shout at the ones in front sticking their heads out of their vehicles, egging them to move. The chirping of birds gets lost in the constant honks of motor vehicles. Its mayhem everywhere. Curses and abuses flow around like it were running out of fashion. A Parsi looking guy is concerned about the scratch the speeding motorbike just left on his brand new car. His abuses get lost in another set of honks from the vehicles behind him. Two Muslim women take advantage of the halt and cross the road along with their children. They walk past me shaking their heads and cursing the rising traffic related problems of this city. I see a young man get out of his rickshaw stuck in the jam and making his way to the front with files clutched tightly in his hands. All set for the interview, I think. I can feel the tension writ large on his face. He hardly notices the beggar who pleads him for alms, but folds his hands and seeks blessings from the temple at the corner while still finding his way out of this jungle of vehicles. Pleading for Divine intervention. Strange how our prayers are so dependent on each other. For beggar, it would have been like answer to his prayers if the young guy would have dropped a couple of nickels in his bowl. And the young chap desires divine help to impress the person he is going to meet, so that he drops the job offer in his bowl. In this sea of vehicles and irritated audience, there is hardly anyone who has a smile on his face. I see tense faces, angry ones, irritated bunch and the vocal lot. Babubhai places my tea on the table. I take a sip and marvel at the fact that how conveniently we have forgotten to smile. There are seemingly a million forces at work to wipe off that smile from your face. All that matters is how to cling on to the next rope from the one that you are hanging from presently. All I see around is childhood lost. Innocence raped. Conscience murdered. I glance at my watch. Its 9:00 am. Time to move. I gulp the remnants of my cup and head to clear my dues. I let out a small shriek at the new set of honks from the background. That's when I notice the little ragpicker behind this bread stall, combing through the garbage and sorting out stuff. In that moment, to me his garbage bag looks like the route to salvation for all the discarded articles within his sight. Those who go into his back are in with a chance for a better tomorrow while the others retire to their destiny. The ragpicker goes about his business and moves his hands through the garbage like an expert. His hands have been trained to sift wheat from the chaff. He has been thrown in front of life to face its brutalities and survive, while his peers are parroting their way through Darwin's theory of survival of the fittest. Strange are the ways of nature. My thoughts are interrupted with a sudden change of expression on the face of the ragpicker. He seems to have come across something significant for him to let go off his bag and get completely involved with the catch. At a closer glance, I recognize the wrapping. A bar of chocolate. 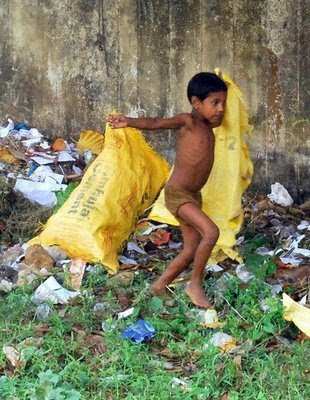 As the ragpicker unwraps his find, I can see a beam of happiness in that smile of his. The smile of contentment. Unwary and uncaring of what lies ahead in the day. Just enjoying this moment of bliss. Living in the moment. I smile having witnessed this scene. I silently wish how better off we would be if we could start living and enjoying the moment while it lasts instead of worrying about what lies ahead. I silently wish for some sanity in this seemingly insane world. I silently wish for the lost childhood in each one of us. I silently wish for a better tomorrow. Wow.. such a touching story. I totally agree the fear of tomorrow has completely clouded our today. We are no longer concerned about what we have today.. Nice post..